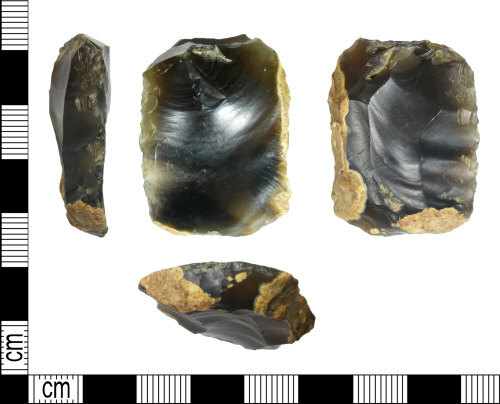 Late Neolithic to early Bronze age flint scraper?, 36mm long, 28mm wide and 7mm thick with a weight of 11.74g. The object is rectangular in form and sub rectangular in cross section. It has invasive, low angled, scaled re-touch on its dorsal surface and a clear bulb of percussion on its ventral face. It has abrupt, short, scaled re -touch on its distal end and semi-abrupt, stepped invasive re-touch along one long edge. The object could be a scraper or a blade?